Breastfeeding is scientifically proven and backed by the World Health Organization (WHO) as the best way to provide infants with the nutrients needed to maximize survival and ensure healthy development. In 1990 the “Innocenti Declaration” was drawn up recognizing the qualities of breastfeeding and despite 25 years hard work, there is more to be done. What are the benefits of breastfeeding to the baby? Breast milk is safe, readily available, and contains powerful antibodies that help prevent illnesses such as pneumonia and diarrhea – two main global causes of childhood mortality. Adolescents who were breastfed are also less likely to be overweight, obese, suffer from Type 2 diabetes as well as Leukemia. The March 2015, Lancet Global Health Report provided evidence on a study of Brazilian women born in 1982 showing they had higher IQ’s, higher levels of education and higher paid jobs after being breastfed from birth for at least 12 months. And this is just one of many studies on intelligence test performance. 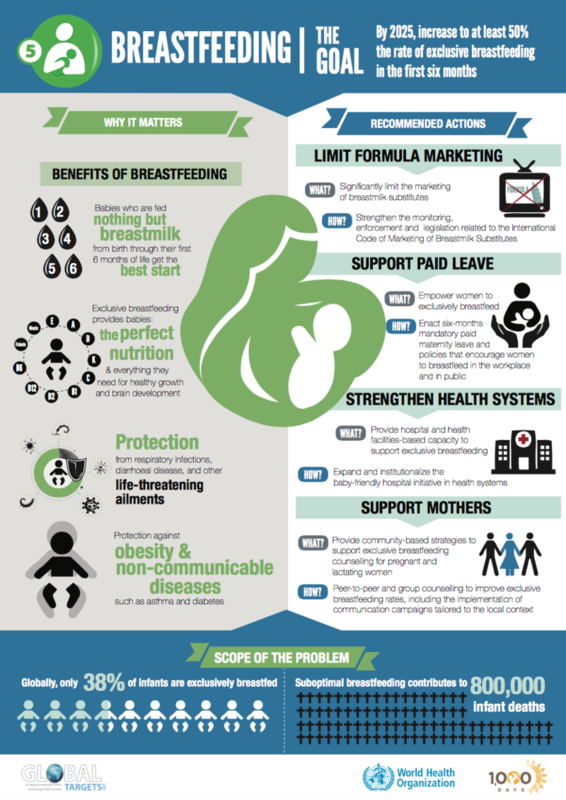 How do Mothers benefit by breastfeeding their baby? Mothers who breastfed their baby have a reduced risk of breast and ovarian cancer, post-natal depression and Type 2 diabetes and many mothers also describe breastfeeding as a magical bond between them and their newborn; benefits that go far deeper than just the nutritional level. Did you know that some women consider breastfeeding to be a natural method of birth control, and claim that it is up to 98% safe! According to guidelines provided by the World Health Organization (WHO), babies should be exclusively breastfed from within one hour of birth and “on demand” day and night, for at least six months. Afterwards, breastfeeding should ideally continue up to two years of age whilst introducing nutritious, complimentary solid foods. WHO have reported that if this regime were followed 800,000 child lives would be saved each year. Instant formula, which is heavily marketed across the globe, does not contain the same benefits as breast milk and further risks arise from unsafe water, unsterilized equipment and potential bacteria in the powder. So why don't more women breastfeed? The Centre for Disease Control and Prevention statistics show that only 28% of women in the US breastfeed for a full 12 months and WHO reports that globally less than 40% of infants are even breastfed for six months. So despite all the facts, why don't women breastfeed longer, or at all? The major factor that prevents women breastfeeding longer is that they’re working. Since World War II when more women entered the workforce there has been a decline in breastfeeding. In 2014 breastfeeding hit the lowest rate since the 1970’s in the US. Those women who do return to work also often abandon breastfeeding due to lack of time, private space and support from employers. World Breastfeeding Week (WBW) 2015 was celebrated in more than 170 countries promoting breastfeeding and empowered rights for the mother and baby. WBW is organized by the World Alliance for Breastfeeding Action (WABA). The theme for 2015 was “Breastfeeding and work – let’s make it work” and follows on from the 1993 campaign promoting a “Mother Friendly workplace”. The Bureau of Labour Statistics shows 57% of mothers return to work before six months, up from 53% in 2004. As the US is one of the few developed countries without paid maternity leave, the choice to come back to work becomes more necessary. Race and income are driving factors. Wealthy whites show the highest rate of breastfeeding where as mothers with low income jobs are compelled to return to work sooner due to financial strain, as many low-income jobs are less likely to offer a formal maternity package. Other global initiatives include more breastfeeding teachers in hospitals, awards for breastfeeding friendly employers, stronger maternity entitlements and improving national laws and practices. Did you know thanks to the collaborative work between WHO and UNICEF’s Baby Friendly Hospital Initiative there are over 152 countries offering breastfeeding counseling for mothers? So, for mothers feeling the pressure of returning to work, there are many initiatives taking place, but there is a lot more that needs to be done in changing the attitudes of business owners across the globe. Why not speak with your employer about taking steps to improving your workplace ethics around breastfeeding?